Inventory We are a resale marketplace, not a box office or venue. Ticket prices may exceed face value. This site is not owned by Allstate Arena . 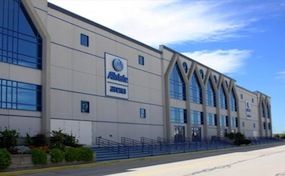 Allstate Arena is a multi-purpose arena in Rosemont, Illinois. It is home to the DePaul University's men's basketball team, the Chicago Wolves, of the AHL, the Chicago Sky, of the WNBA and the Chicago Rush, of the AFL. It is located near the intersection of Mannheim Road and Interstate 90, adjacent to the city limits of Chicago and O'Hare International Airport. The Allstate Arena has been featured in a number of music videos by artists such as: Scorpions, Justin Beiber, and Miley Cyrus. The original name of the venue was The Rosemont Horizon, but in 1999 the naming rights were purchased by the Allstate insurance company. The facility is the home of DePaul University’s men’s basketball team and has been since 1980. ArenaRosemont.com is not affiliated with any primary box office or supplier. We are a privately owned and operated business specializing in sales in the secondary market. Prices are dynamic and closely match demand so they will fluctuate quickly. To buy tickets for any Allstate Arena events in Rosemont simply click on the event of interest or call our operators at anytime.